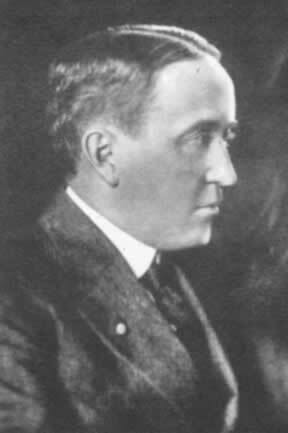 At the end of the 1800s, Frank Meade came to prominence as one of the leading residential architects of Cleveland. His architectural career spanned nearly five decades. His work first emerged among the ruling class mansions along celebrated Euclid Avenue. He had studied architecture at MIT and worked four years in the Chicago office of Jenney and Mundie. Initially opening his own office in Cleveland around 1893, Meade eventually entered partnerships which included other prominent Cleveland architects Alfred Granger, Abram Garfield (son of the U. S. President), and for the longest period, James Hamilton. Frank Meade lived on Euclid Avenue and was active in Cleveland's upper society circles. He was the founding president of the Hermit Club. As the industrial owners and professionals' families migrated to the suburbs of Wade Park, Bratenahl, and Shaker Heights, Frank Meade earned commissions for new homes there as well. He also designed large residences for the pre-Cleveland Heights villages of Ambler Heights and Euclid Heights. It was especially during the last 30 years (1911-1941) of his career, with James Hamilton as his partner, that their practice flourished. Meade & Hamilton also found success in designing numerous social club buildings including the Union, Roadside, Euclid and Century clubs in Cleveland and the Erie and Lamb clubs in New York City. Today, dozens of Meade & Hamilton homes of traditional revival styles still stand proudly as a testament to the enduring appeal of their work. Their designs can be found throughout the western neighborhoods of Cleveland Heights along Fairmount Boulevard, including the Euclid Golf district, and on Edgehill Road in what was called Euclid Heights Village. Frank Meade photo from Western Reserve Historical Society.